WIMA DC-LINK MKP 6Metallized Polypropylene (PP) Capacitors in Cylindrical Case. Capacitances from 75 µF to 4920 µF. Rated Voltages from 600 VDC to 1500 VDC. Marking: Colour: Metallic. Marking: Black on silver label. The capacitors are non-polarized and are optionally available with "male" and "female" terminations. 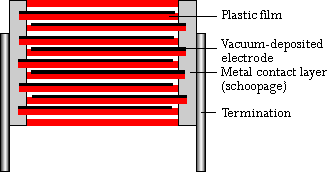 The earth bolt is electrically inactive and serves for fixing and/or earthing of the metal case.